FOX8 will begin screening controversial HBO news magazine show Vice from next week, beginning with the final episode in which former NBA bad boy Dennis Rodman visits North Korea. This airs in the US on Friday. FOX8 will then screen earlier episodes from the 10 part series. Taking its name from the taboo-breaking, multimedia company co-founded by journalist/entrepreneur Shane Smith almost two decades ago, VICE is the new series from HBO that goes behind the news cycle to cover some of the most shocking, compelling and entertaining news stories that are often overlooked by mainstream media outlets. Each week, VICE smashes barriers of decorum in covering topics such as out-of-control political assassinations in the Philippines; the sumo/mixed martial arts craze that has swept Senegal; tensions on the India-Pakistan border, considered the most dangerous in the world; and the precarious nuclear stare-down in Kashmir. FOX8’s premiere episode on Wednesday, June 19 will air just days after its US broadcast, and focuses entirely on Dennis Rodman’s controversial trip to North Korea. 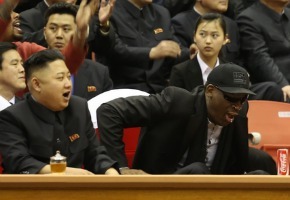 The NBA Hall of Famer was part of the delegation including VICE correspondent Ryan Duffy and three players from the Harlem Globetrotters who spent a week in the basketball-crazed city Pyongyang. While there, the team of “Basketball Diplomats” met with North Korean leader Kim Jong-un before taking on North Korea’s “Dream Team”. In other VICE episodes: as US troops prepare to leave Afghanistan, the Taliban stoops to an all-time low by recruiting confused, innocent children – some as young as six – to be suicide bombers; a kindly South Korean preacher runs an underground railroad to rescue North Korean refugees who have made it out but are still in grave danger; and in Mauritania, a country rife with poverty and food shortages, being fat is desirable, so wealthy daughters are sent to eating camps. VICE’s fearless approach is like nothing else on television and will show some of the scariest, weirdest and most absurd customs and practices known to humanity. Founded by Smith and Suroosh Alvi in 1994, VICE Media is now a leading global youth media company with bureaus in over 30 countries including Australia. It attracts tens of millions of viewers and readers to its network of online channels dedicated to music, fashion, travel, news and sports. Locally, VICE Australia – who is about to celebrate its 10 year anniversary – has travelled to the opal-filled town of Coober Pedy, Wadeye in the nation’s top end, as well as Indonesia, Romania, Mongolia, Sierra Leone, Bolivia and beyond. In the process, they have covered everything from cave dwellers and Aboriginal heavy metal gangs, to baby wombats and the Nimbin Mardi Grass Marijuana Festival. VICE’s acclaimed television series, produced by HBO, has been making headlines around the world since it launched earlier this year.